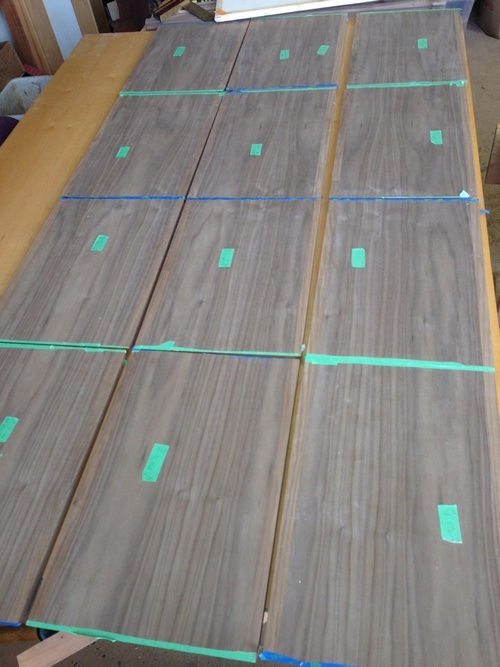 After purchasing a high-quality sheet of 3/4" thick walnut veneer plywood plus enough 4/4 rough walnut stock to create the edges, the first step is to lay out the cases to take advantage of the best grain pattern. Then the sheet is cut into manageable subsections. 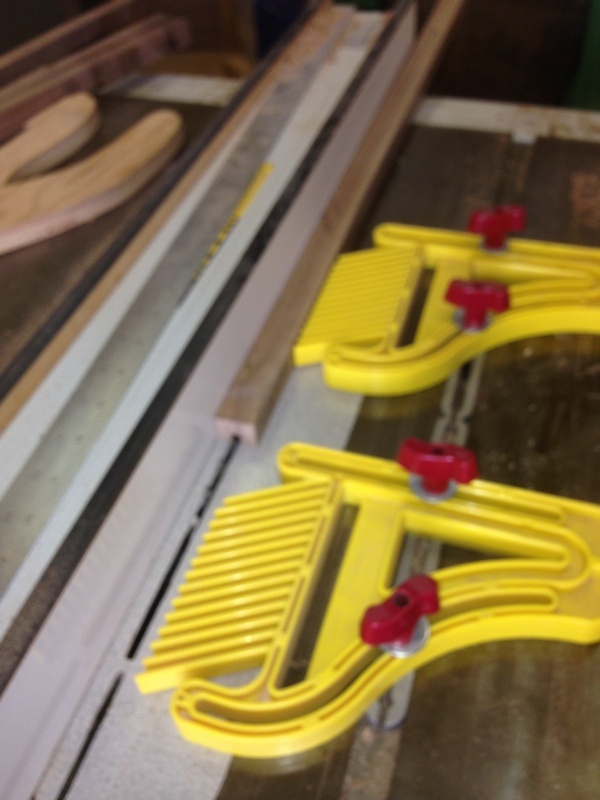 I'll rip-cut the case pieces in sets of two sub-pieces - either a top-side or bottom-side combination. I need to identify each sub-piece at all times so that later when they are all cut to size they can be reassembled into the cases. 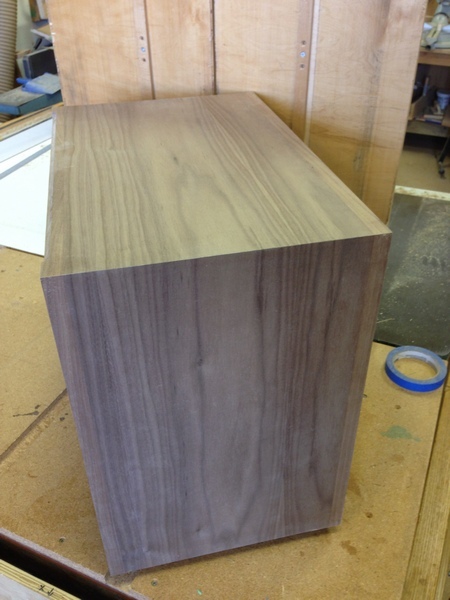 Using a combination of jointer and planer, I mill the rough walnut stock to over-sized edge material. The edge will be 3/4 inch wide so that a design detail can be routed in the top edge, and exactly the thickness of the veneer plywood. However, at this point I mill the edge material 1/4 inch thicker than the plywood prior to gluing. 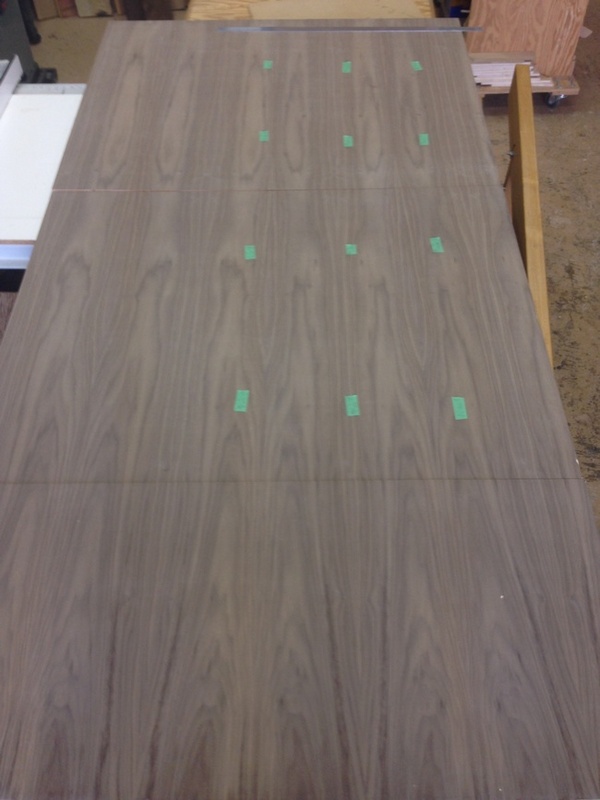 The edge material will be glued to the edge of the veneer with a spline hidden in the middle. 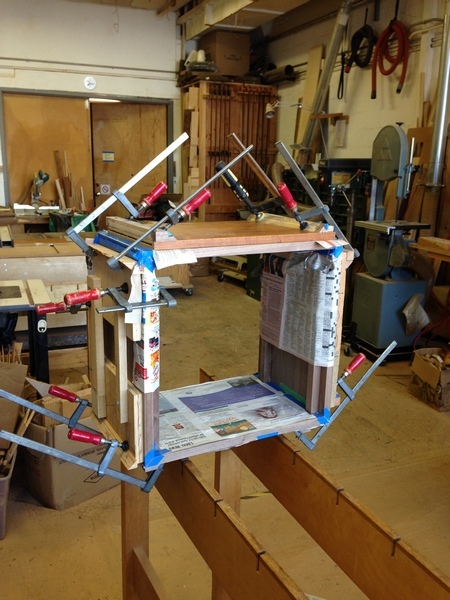 This both strengthens the bond and aligns the edge material during gluing. I mill a quantity of spline - which is roughly 1/2" wide by 1/4" thick. 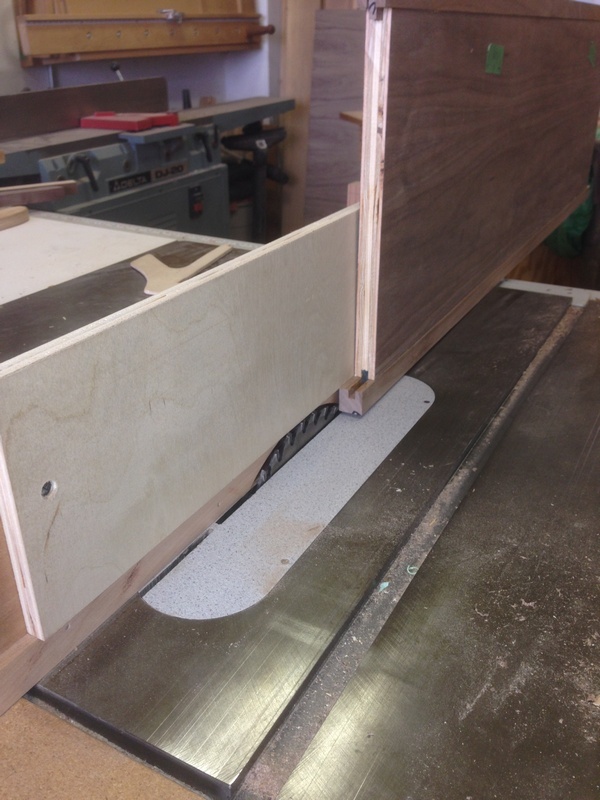 Pictured below is the process of cutting the groove in the edge material. This is also known as cutting a dado in the material. 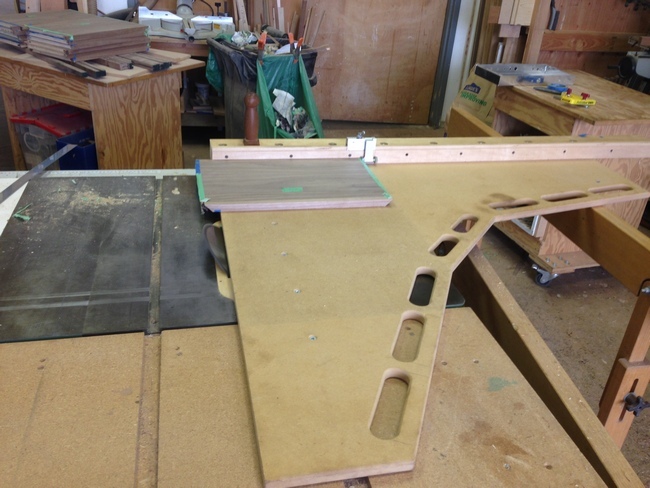 Similarly I cut a groove, or dado, in the edge of the plywood sub-pieces. 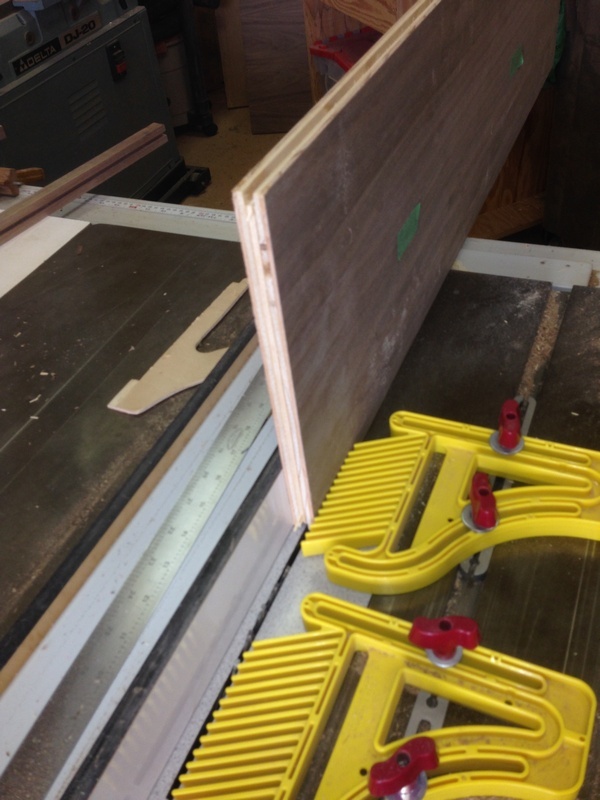 With all dados cut and plenty of spline material on hand, it's time to glue the edge material to the plywood. 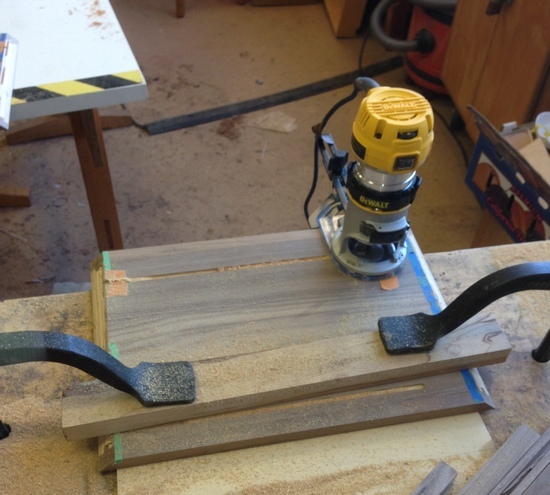 It is easiest to do this in sets of two sub-pieces being clamped together. All veneer faces need to be covered. 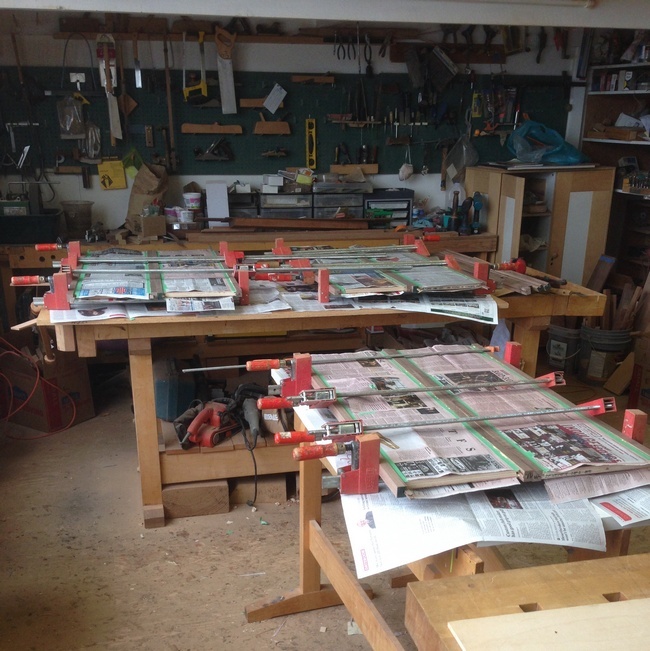 It is a tedious job but necessary to cover all of the veneer faces with paper taped exactly to the glue edge. You don't want to inadvertently smear glue on the veneer - it's a devilish job to get off without marring the veneer. After removing the paper and cleaning the tape off the joints, now I need to remove the extra roughly 1/8" extra thickness of the edge material from all seams. This is a critical step that requires great precision. 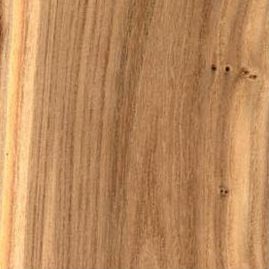 Remember that the veneer show face is probably 1/45 of an inch thick - ie, paper thin. I don't ever want to cut into it, or there would be an ugly flaw. 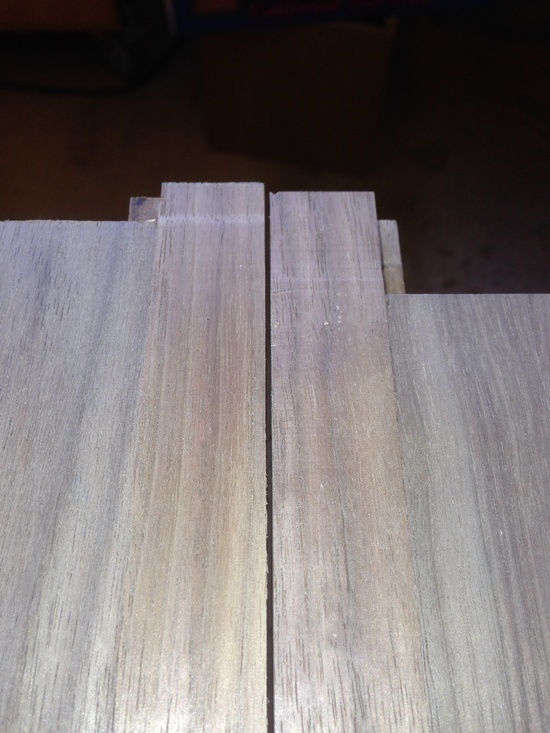 So the steps I will take are first to use the table-saw with a guided-cut to remove the excess edge material to within 1/16 inch of the veneer, then use a pattern-bit on a router to remove the excess to within thousandths of the veneer, and finally hand-scraping to completely level the edge material to the surface of the veneer. After running the long edge past a pattern-guided router, now I use a hand scraper to finish the smoothing of the edge material. 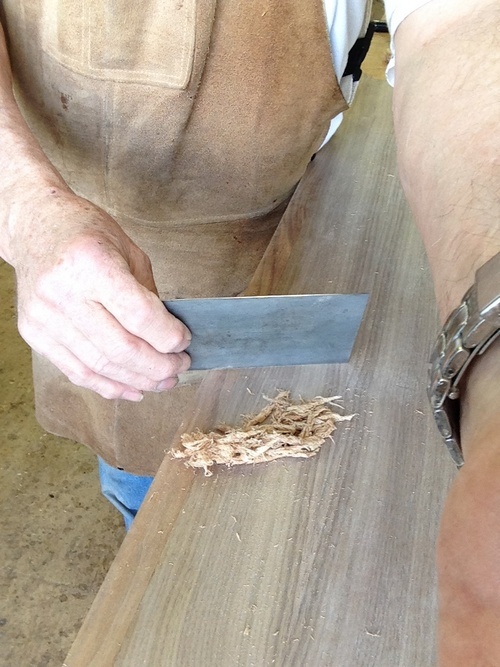 A hand scraper is like a plane that can literally a 1/1000 of an inch of material at a time. The result of all this post-glueup cutting, routing and handscraping is to make sure the edges of the pieces of the guitar case are exactly level with the veneer - without cutting into the veneer. The next step is to cut the individual sides of the cases, each with a precise 45 degree angle. 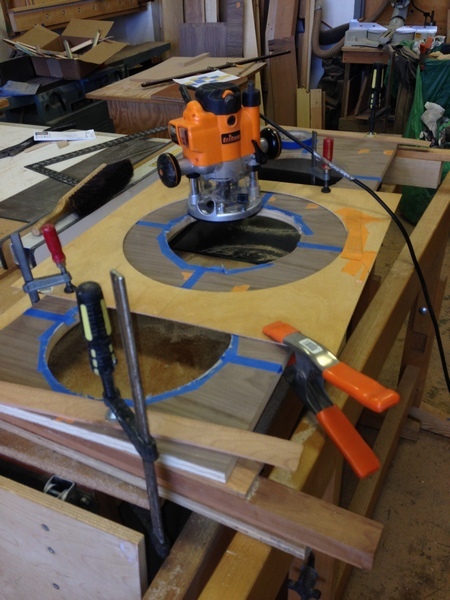 To do this I use a large, very accurate cross-cut table that assures all sides are cut exactly. Here are the three cases laid out end to end. 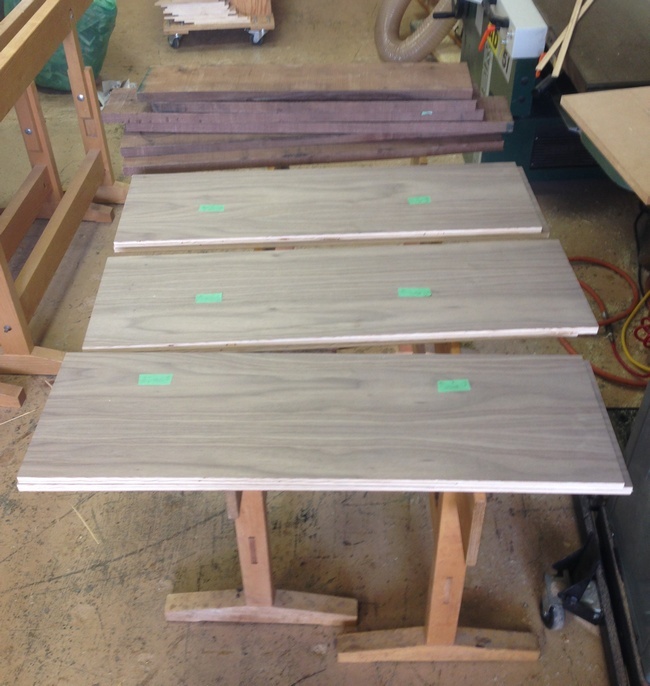 Each has its long edges trimmed with 3/4 inch solid walnut. The grain flows from side over the top and around. To strengthen the corner joints,I insert 3 biscuits per joint. These stiff little biscuits swell in a joint upon application of glue and assure both the fit and tightness of the joint. To cut the slots for the biscuits, I use a biscuit cutter set at 45 degrees. 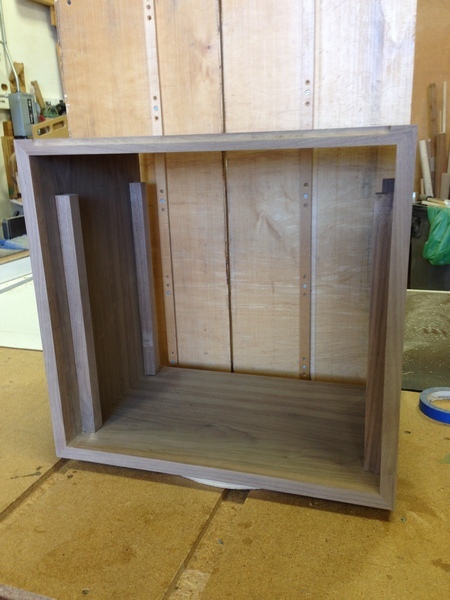 Now each case is test-fit without glue, ie, dry-fit. This is time to make sure all slots have been properly cut, biscuits fit, and you have figured out how to clamp the joints tightly. 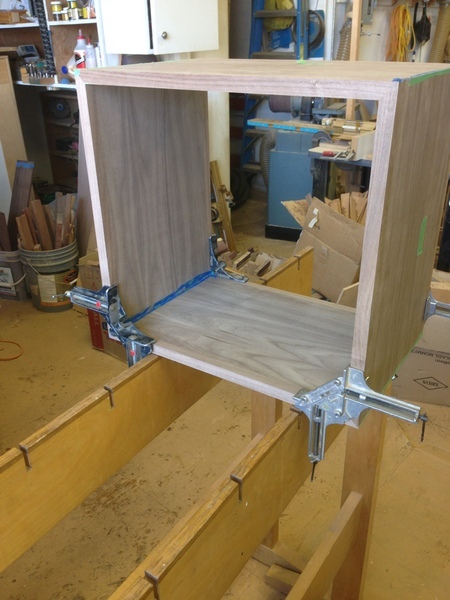 For the latter I make 4 temporary side pads with 45 degree clamping edges..
After removing clamps, paper, tape, glue, etc. I check to see that each case is accurately assembled. 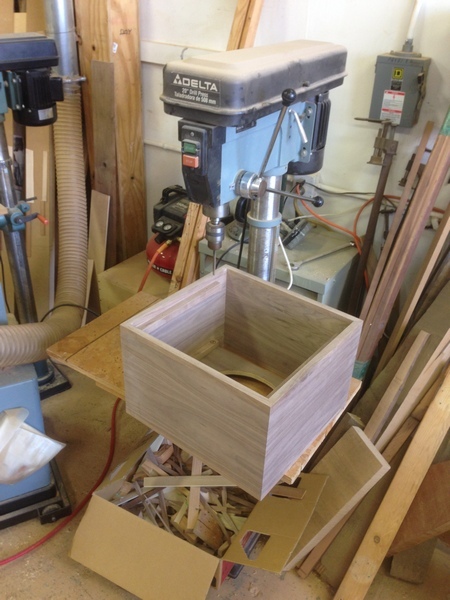 Here is an example of the grain flow around a case corner. 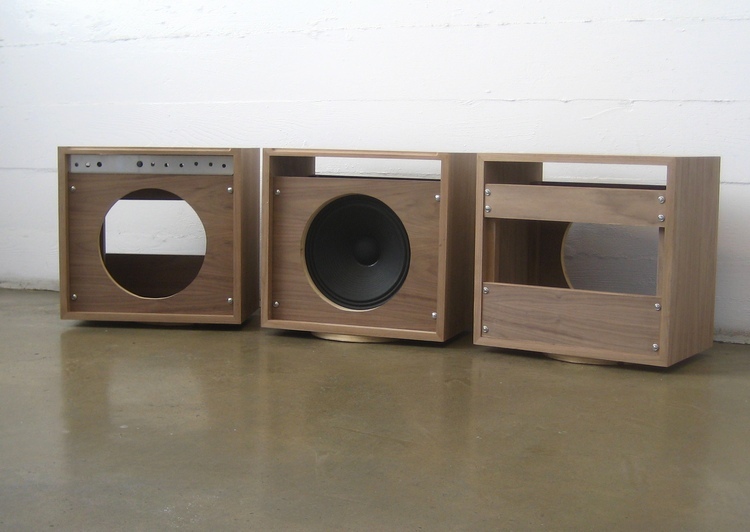 With the cases complete it's time to make the additional parts - the speaker baffles and rear baffles. 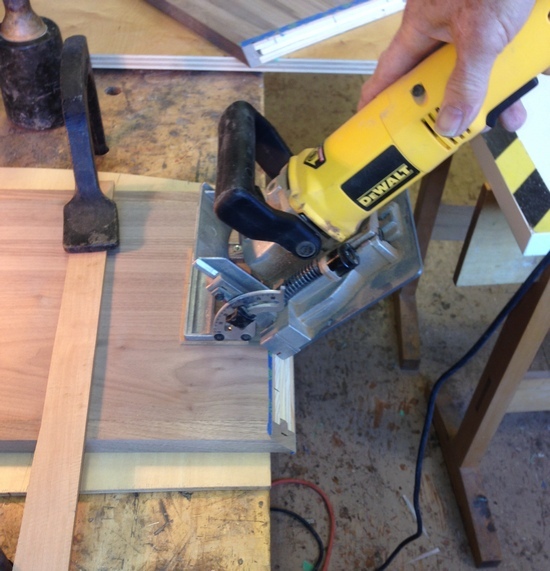 To make the speaker baffles, I first rough-cut the holes for the speakers using a jig saw. 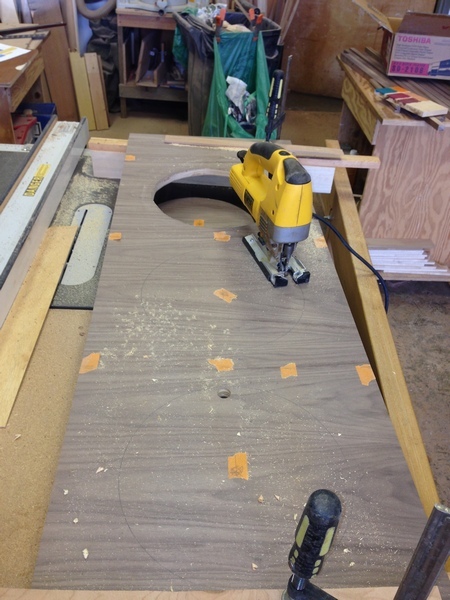 To cut the accurate speaker hole, I make a pattern that will guide a router to cut a clean, accurate circle. Later I will cover the plywood face of this hole with iron-on veneer tape. After cutting the speaker baffles to size, and making the rear baffles, I lay out the placements of the screws holding them to the cases. Because the rear baffles must be removed from time-to-time it is best that their screws are secured with metal thread inserts. First I drill all holes for the baffles. Then for the rear baffles I insert a metal threaded insert for each screw. 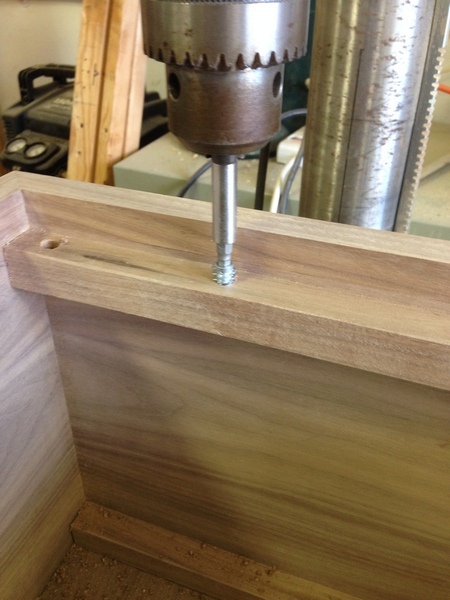 I use the drill press to ensure that the metal insert is installed accurately. Now it is time to assemble the guitar amp cases. Here they are shown in various stages of final assembly. They are essentially done except for some additional hardware (handles, feet, chassis bolts)..